For those who have never experienced it, this half day long charrette is organized by the city and the development team (comprising urban planners, architects, engineers, economist, etc.) 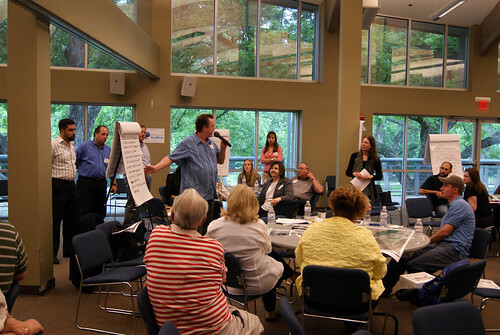 to engage the citizenry and illicit feedback that will help shape the future of the plan going forward. I engaged in the process for the first time as a citizen, and I hope that my professional experience in community and mixed-use/TOD development offered something unique. While the event had a good showing for something of it’s type (a little over 100 people from the voting public participated) this sort of input is a magnet for stakeholders in the process. It is the first chance for land owners, business owners, and civic leaders to help shape the future. 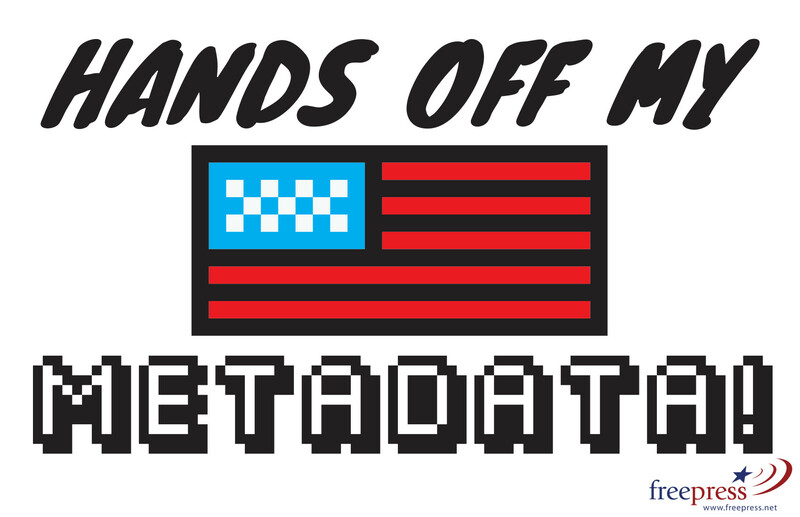 To this point, the development team has only been meeting with city council and staff, and it is through this process that the citizen’s voice will hopefully be heard. My personal interest in this project has largely focused on what we can do to better the community. The vast majority of the newest residents to Rowlett (who’ve moved here in the last 10 years) have done so for two reasons: 1] The neighborhoods are nice and the homes are inexpensive; and 2] The close proximity to Dallas minimizes their commute. This has lead to Rowlett becoming the very definition of bedroom community. In that time, though, neighboring communities have pulled out all the stops to create developments intended to be attractive regional destinations within the Metroplex. Nearby Garland built the Firewheel Town Center, a purely artificial construct that is, in fact, simply an outdoor mall that is neither a town, nor much of a regional center. However, it offers a host of pedestrian friendly shopping surrounded by a ring of greyfield parking that is quite an experience in the middle of August. While a financial windfall for the city in a lot of ways, the development itself has left the people in the actual downtown town center of Garland a bit disgruntled why so much of their tax dollars and incentives went north to largely service the nearby cities of Plano, Sachse, Wylie and Rowlett, rather than rebuild and enhance their ancient and aging infrastructure. 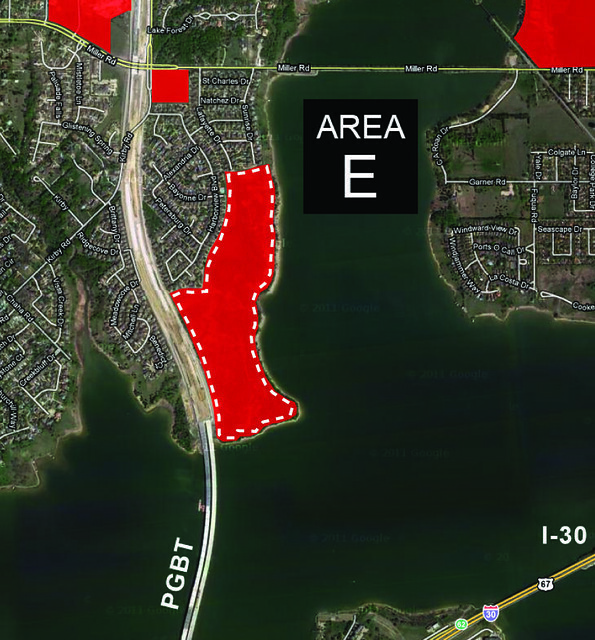 Another recent development is The Harbor in Rockwall, which capitalizes on the same unique benefit that Rowlett hopes to, being on the shores of Lake Ray Hubbard. Although the architecture reminds me of a Las Vegas interpretation of Italiante, the outdoor spaces included are truly triumphal and very nice, with extensive fountain laden plazas and terraced areas embracing the water that often feature concerts and outdoor events. As a result of the downturn, however, the financial viability of such an endeavor is called into question as the developer filed for financial restructuring last fall in order that they could lower rents. Not to be outdone, and looking to leverage their little piece of lakefront property, Garland had also developed the Harbor Point project along I-30 with destination retail anchor Bass Pro Shops as their hook (forgive the pun). Originally planned as a much larger development of multiple project types, the brakes were put on it, and the development went up for sale in 2009, and only just recently found a buyer. I find it particularly ironic that the development’s website has even expired. I love having a Bass pro Shop this close, and the Flying Saucer a heck of a watering hole, but Rowlett has potential for so much more that just a big box retail draw. 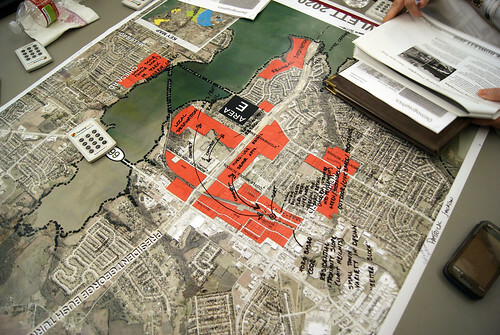 As recently as January 2009, prior to the notion to hire a planning group to help the city engage in this update to the comprehensive plan, Rowlett had already been thinking about ways to capitalize on these new assets in a similar manner as their neighbors had, and issued a press release about the Water’s Edge Development. 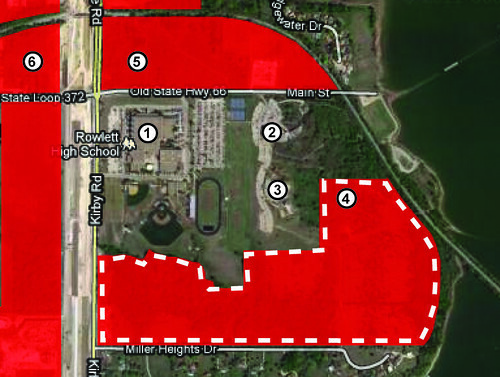 Clearly a pre-recession vision for Rowlett, it contemplates massive amounts of mixed-uses all developed on city owned land through a long term lease. I believe this concept is being fundamentally reconsidered by the city and the planning staff, and this update to the comprehensive plan will contain thoughts on where this vision should go in the future. As a result, I, as a concerned citizen, came into this process curious to see what vision my fellow citizens had and I was rather surprised. There were several areas of the city to be considered. Rowlett is currently in the unique position to have the President George Bush Turnpike and a DART rail station both opening up in the next year or so, with profound implications to the currently composition of the community. Five portions of the city were considered amongst seven citizen groups, each considering their area in great detail. 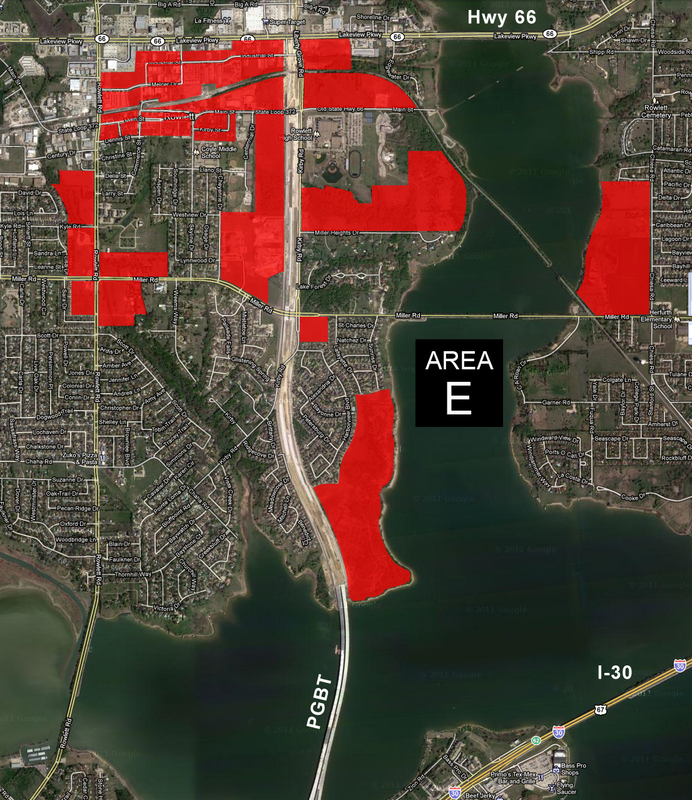 Our portion focused on a large area south of Hwy 66 along including  Downtown Rowlett and Main Street,  the city owned land known as the Water’s Edge District, and the  privately held property known as the Waterfront Entertainment District. Being at the crux of the intersection of where PGBT (President George Bush Turnpike – est. completion end of 2011, shown in orange) bisects the city to connect with I-30, and where the DART rail terminates (shown in yellow with the DART rail station noted with an “*“), this is the location where most people are focused because it is probably where we will see the first returns on our investment in the rail and the turnpike. Incorporate the natural surrounding into development. 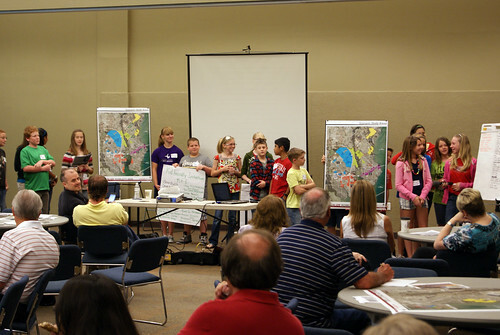 It might be well to note here that part of this exercise involved a large group of students from the local middle school who did their own analysis of the city and presented to the group at large their ideas for what they would like to see in their community. I might add their initiative of coming up with a city logo that resembled an @ sign with a leaf in the center and the slogan “Growing into our Future” was by far the best branding idea posited that day. Keep that in mind, because these ideas found resonance in our notations later. Pretty universally though, after seeing our lists and the presentations of the other groups, I believe the Charrette at large feels very strongly that we need to first and foremost maintain the small town feel around the community. 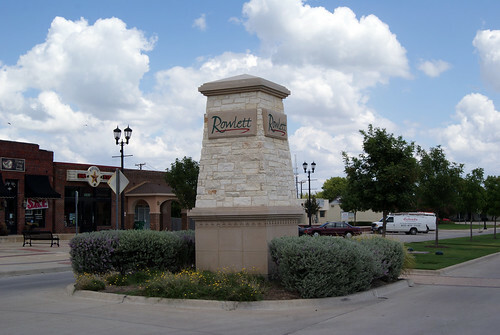 Downtown Rowlett is very much the model of a typical small downtown, consisting primarily of small retail and civic functions including the  Rowlett City Hall & Chamber of Commerce,  Public Library,  Single story retail,  Planning Department,  Farmer’s Market, and  DART Rail station (est. opening 2012). While I had never personally really valued the main downtown as a strong symbol of the community, the majority of our group did. In fact, many felt very strongly that it was the single most important focus of the community and were very concerned about what development meant for the downtown. It is adjacent to Main Street that the DART rail will arrive, not beside the two development areas on the banks of Ray Hubbard, and it is here that the city has already invested a good deal of money in constructing a first rate public library (built within the last decade or so) and a lovely downtown streetscape (the legacy of the prior mayor). 1] Preserve and enhance the historic and small town feel through implementation of a form-based code for the area which would set down guidelines for development. These guidelines would not limit development, but preserve the character of the downtown by encouraging variety and within a consistent framework. 2] Encourage the development of small, unique businesses that are consistent with the existing character of the downtown. 3] Downtown development should offer flex-retail and live-work spaces and opportunities. 4] We felt that the planned parking for the DART rail may not be enough in the future if gas prices continue to rise, and commuters from outside Rowlett drive to the rail station to commute (as we’ve seen in the past). There were fears that such overflow parking would congest the downtown and that the city would have to respond somehow. In order to prevent an undesirable solution like a huge, visible parking garage, we suggest that a new development, possibly a mixed-use/residential opportunity, would accommodate this overflow within a concealed garage as part of that design. This would have the added benefit of providing additional parking for retail development as well. 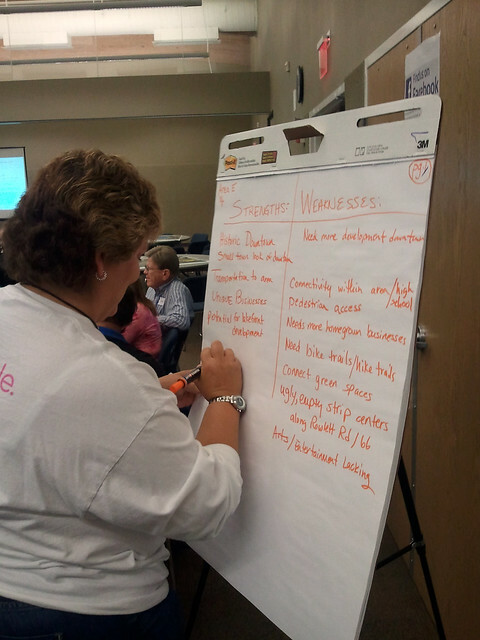 5] Establish a “Better Block” initiative, similar to what has happened in other parts of the metroplex (i.e Oak Cliff) to help the people of Rowlett participate and see the potential of their community. 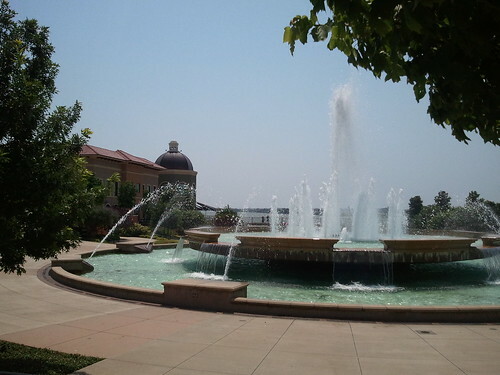 6] Preserve and enhance the civic character of the downtown by renovating it and developing new outdoor gathering spaces with landscape features, sculptures and fountains. 7] Implement green and sustainable design practices. 8] Help grow the local farmer’s market into something bigger, and incorporate a community garden for citizens to use. Being an architect who is heavily involved in this sort of development, I must admit how surprised and impressed I was that most of these items were thrown out by other members of the group. 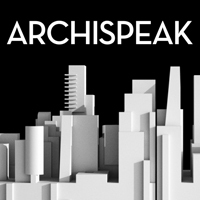 When they brought up the need to develop the downtown within the same morphological character, I offered the notion of a form-based code, of which the majority of the group was unfamiliar with. Aside from that, the ideas of flex retail and live-work units, the Better Block initiative, the integrated DART parking, and just about everything else were offerings they made. The majority of the group also felt that the location of the civic functions, the City Hall and the public library in particular, were a strong asset and should therefore be maintained. It was to a chorus of puzzled faces that two of the council members in our group spoke to the possibility of moving these civic functions to one of the other development areas (either the Water’s Edge, or the Waterfront Entertainment District) as an anchor within the development. I tend to agree with the group at large. I like the current location of our civic buildings, and really don’t see the need to move them. I’m not convinced civic functions create enough critical mass to help the new development in an appreciable way that would offset the cost to taxpayers. Especially when, if that money were spent downtown to renovate existing buildings to include public plazas, fountains, etc., would further enhance that location at a much lower expense, and embrace the incoming DART rail and the existing improvements we’ve already paid for. Besides, we’ve waited 25 years to get DART and when we’re on the threshold of it’s completion we are going to move the government to a location of the city that doesn’t have a DART stop? How does that make sense? In any event, I have faith that the government won’t do this unilaterally, and they would open such an option to the voters for consideration before uprooting our civic core. This is one of the prettiest areas in all of Rowlett. The view of the park from within the storefront clad south wall of the community center alone is just lovely. The area already has a certain degree of critical mass, with traffic going to and from the community center and the high school daily, and the Wet Zone experiencing heavy use during the summer months. One of the drawbacks is that the railroad line severely limits the site’s access to the waterfront directly, pinching down any usable waterfront access. 6] 250,000 square feet of restaurant pad sites. That is an astonishing amount of development (hotels, malls, high density apartments) to be crammed next to a high school, community center, water park and a public park. Now, as part of the charrette we were given information on the trade area demographics data for an area that included Rowlett and portions of surrounding communities likely to shop here, including Garland, Sachse, Rockwall, Wylie, Murphy and others. In that report, they predict that the total estimated retail demands for that entire area over the next ten years will be approx. 2.5 million square feet of new retail. This 2009 plan, if implemented, would have put into the market, at this one location, over 41% of the anticipated retail development for the entire trade area! Well, when our group considered The Water’s Edge, we didn’t see the development here being quite so extensive as had been envisioned in this study. In fact, we felt very strongly that the presence of the four strong community components would argue for a development that is more community based, focusing being more of a local draw for Rowlett citizens, aimed more at retaining resident dollars from leaking into neighboring communities than drawing from the region at large. There should be improved indoor civic function as well, like an arts center or some manner of nature preserve (one suggestion was for a native Texas Freshwater preserve that profiled the different lake & water species throughout the state). There should be improved outdoor civic functions, that build on the success of the water park and Pecan Grove by establishing things like a skate park, climbing wall, bike trails and a community access point to the waterfront like a boardwalk or a beach. This should also include an outdoor plaza or mall that would tie everything together. Retail should augment these functions, and cater to family and teenage oriented customers. (I offer that two big retail leakages are movie theaters and outdoor spaces in which teenagers can while away the time. Movie theaters can provide the anchor, and contribute to the artistic aspect of the development’s identity. Retail opportunities that work well with these functions, small restaurants, coffee shops, unique clothing stores, etc. would dovetail well with an arts district, and keep teens socializing in Rowlett, next to their high school. This would work well with the way the site is lain out, allowing the retail to front PGBT, and buffer a transition back to these local destinations and then have to pass through the retail to get to them, which retailers love). We saw that the properties owned by the churches were, while not a financial boon to the city, offer some opportunity for future development sites for this vision as well, because with their sanctuaries and community centers, and with help help from the city developing the streetscape, very positive pedestrian linkages could be created between this arts district and the downtown. We almost universally rejected that this location should be the premier regional retail destination. The last featurearea I’d like to elaborate on front the charrette is the Waterfront Entertainment District. 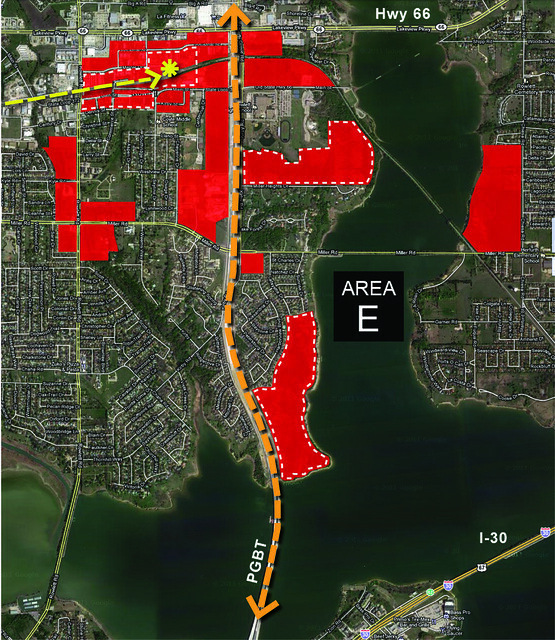 Privately held parcels of land, this area has all the ingredients for a successful development. Located just across the water from the intersection of PGBT and I-30, with a great degree of frontage adjacent to PGBT allowing for great visibility and easy access, some of the longest waterfront of any of the available areas, and great vantages and visibility in all directions. The land is an incredible opportunity with limited adjacency to existing residential, and an open canvas to implement almost any vision. 1] Encourage retail that would provide an anchor for the development, but wasn’t typical “big box” retail. 2] An extensive mixed-use development that offered retail, residential, and office options. 3] A clear engagement with the lake by way of a marina, outdoor spaces, concert venues, and restaurants with a vista and view over the water. Actually, it was with this area that we were all in the most agreement, because all of the factors concerning it’s location and potential seem to align with it being the focus of Rowlett’s long term retail and entertainment development. With the DART rail station terminating in the historic downtown, we immediately recognized the need to exploit that connection as more than just a downtown resource. We’ve waited 25 years for the DART rail and we need to make the most of it. 1] The DART rail connection in the historic downtown is but a gateway to the community. We should further that by developing connections to other portions of Area E (especially those along Main Street like the Water’s Edge). 2] Pedestrian connections must be clear and pleasant. High school student should feel safe walking across PGBT to their high school along main street, without having to compete with automobile traffic. 3] The ideal connectivity solution would be for the city to implement a free trolley (modeled after such like the McKinney Avenue Trolley in Dallas). This wouldn’t have to be a rail trolley, but could be more of a bus system meant to look like a trolley. We thought that this could be something more than just a bus shuttling people from the DART to the Water’s Edge, but in fact does a loop connecting all the major portions of Area E together, and then back to the DART rail station. 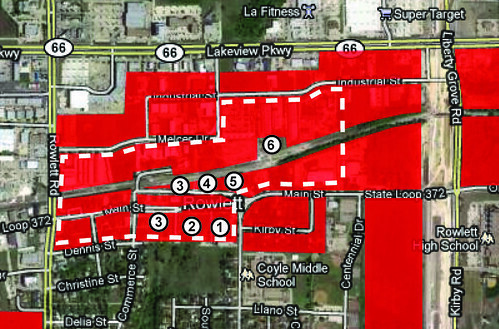 Ideally, this would be something that Rowlett becomes known for, an urban asset that become part of our urban identity. 4] Knowing that certain parcels of land will be on this trolley system will inherently make them more attractive to developers and act as a way for Rowlett to help control the development within this portion of the city. Frankly, we need to creatively embrace the DART rail if it is going to be more than simply a way-point for Rowlett residents and surrounding municipalities to park their cars and get downtown. With that, the charette broke and we leave the planning team to digest the information we generated. There will be four presentations to follow where this information will be brought to the public in an open forum. 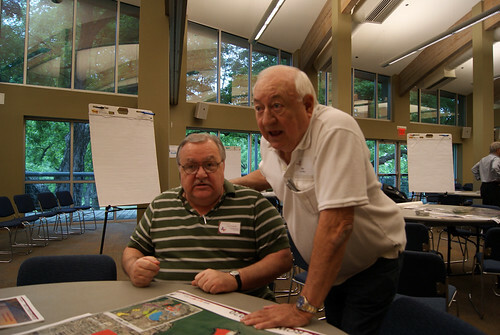 Thank you for the excellent article about the Charrette in Rowlett. I was unable to go to the charrette but feel I have a good understanding of the possibilities now. I agree with your opinions about what Rowlett needs to do to make the most of this opportunity. I am glad others are seeing Rowlett’s potential. I hope it is a reality sooner rather than later. I definitely hope sooner that later! Thanks for the comment. Sure. I’m glad you liked it. I’m heading to the open forum tonight at 7pm. I think they are doing a synopsis of the whole charrette. My write up here is really just our group. 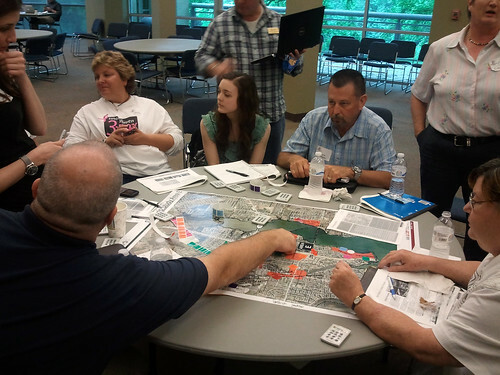 There were a lot of good ideas about the other parts of the city too, and I’m interested to see what the planning team gleaned from our discussion…if they present that at this time. By any chance, do you have a pic of the entire city plan, which shows all of the different “areas” or zones?